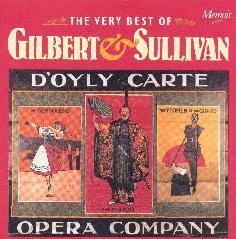 "I am the very model of a modern major general"
"When a felon's not engaged in his employment"
"When Britain really ruled the waves"
"When a merry maiden marries"
This is a compilation from the D'Oyly Carte Opera Company recordings made between 1927 - 1936. These are superb transfers, which I believe are the 'official' Keith Hardwick transfers made for EMI in the1980s. 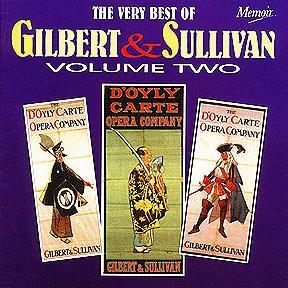 Highlights from the transfers Keith made were used on the EMI double LP The Hey Day of Gilbert and Sullivan, before Arabesque Records issued many of these recordings complete. EMI still hold the copyright on these transfers (not the same as the expired copyright on the original recordings). So, while it is legal to copy from the 78's, it is illegal to copy from any of the reissues of these old recordings. This is where there is occasional confusion that Pearl, Conifer, etc., hold a copyright on Public Domain recordings. It is possible EMI will not release their transfers made from the actual record masters because other companies have now issued these recordings, albeit with inferior transfer from 78s. EMI may still licence these out again in the future if a company was willing to pay them the licence fee, but why should anyone want to do this now when these recordings are once again available from Conifer, etc.? At least we are lucky that most of the official transfers were made available by Arabesque. This is a second volume of excerpts from the electric HMV (Victor in the United States) D'Oyly Carte recordings of the 1920's and '30s. The transfers on the first volume were very good indeed by the standards of 1992 when that volume first appeared. They are still probably on a par with the transfers from EMI's masters by Keith Hardwick, which were licensed to Arabesque. In fact, at the time I had an idea that these could well be the same transfers, possibly licensed by Memoir, but I am not certain of this because there was no credit for the transferor (shame). The second volume does credit a transferor — a chap called Michael Dutton. This name was not known to me until a few months ago when I bought a CD of English opera stars of the '30s and '40s on a small label called Dutton Laboratories. This is one of the few times that I have bought a disc more out of curiousity for the transfers than the recordings, but, my word, I was amazed when I played the disc. The quality of these transfers was absolutely superb — without a doubt the very best transfers from 78's I have ever heard. I even checked the sleeve at one point to make sure that I really was listening to a vintage recording, because the sound was improved so much that they did not sound old in any way. Although they were recorded at reduced frequencies before the introduction of full frequency range recordings, these transfers sounded as though they had been recorded yesterday with modern recording technology. From that moment, I decided that Michael Dutton is without doubt one of the very best in the business when it comes to audio restoration of 78's, and you can imagine how delighted I was to see his name on this second G & S volume from Memoir. Anyway, I have only listened to several items so far, but I just had to write to tell you that it is excellent. As with the disc I describe above, the voices have gained a whole new dimension. Never before have the likes of Lytton, Fancourt, Lewis, Oldham, etc., sounded quite like this (Fancourt's "When the Night Wind Howls" is out of this world (which is most appropriate, I suppose). A slight surface hiss is still audible, but this is soon lost to the ears as you concentrate on the recordings, and it is probably quieter than the hiss you will hear on any previous vintage G & S issues. This is super stuff, and is worth getting even if you already have the good Arabesque transfers of most of these items. (Arabesque did not issue Yeomen on CD or the abridged '31 Pirates, which is used on both volumes; for some reason these were only on their LP issues). There are four pages of interesting sleeve notes giving a brief history of DC and biographies of the performers. There are also two pages of photos of ten of the performers, and the track listings include catalogue and matrix numbers which is always nice to have. The front cover is similar in style to the first volume, with three DC posters reproduced. There are 28 tracks with a running time of 75' 22''. Selections are listed below.